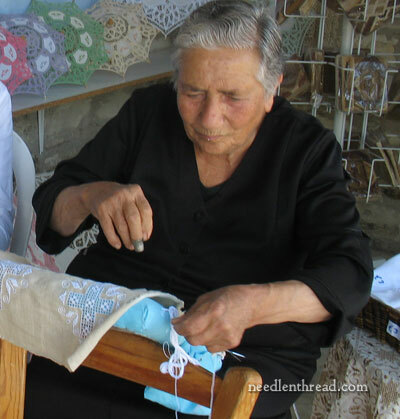 Over the past few days, I’ve been sharing with you some photos from a reader who enjoyed some time in Cyprus learning about Lefkaritika, or Lefkara Lace, a traditional form of embroidery from the island. 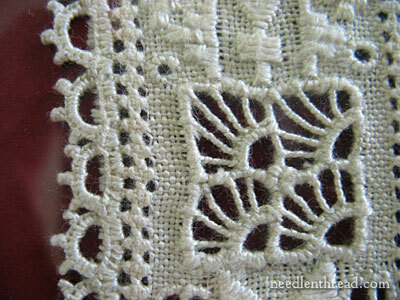 Today, I’m continuing the topic, showing you some close up photos of some of the different motifs used in Lefkara lace. To start, though, let’s look how the Cypriots traditionally work on their lace. They use pillows. This is not to be confused with a bobbin lace pillow, though – but it serves some of the same purposes. 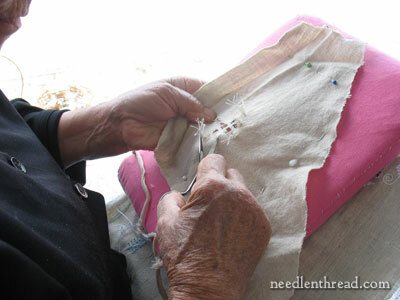 Working on a colored pillow that is propped in the lacemakers lap or on a table or chair, the lacemaker pins the linen to the pillow on three sides, leaving one side free where the hand can slip in to hold the work. The embroidery and the drawn thread work are done in such a manner that either is up – the back looks just as good as the front, so the lace is completely reversible. That’s quite a feat! Though there seem to be many designs for the various elements in Lefkara lace – lots of different takes on the drawn thread elements and on the geometric embroidered elements – the fact is, Lefkara lace is limited in design. 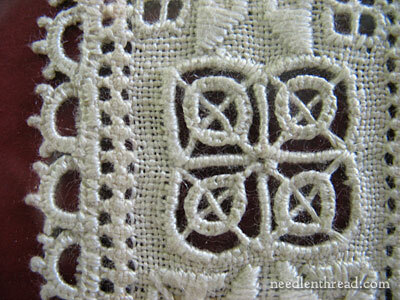 There are relatively few traditional patterns for the lace. Still, though the designs are supposedly few, I love to see the variety of wrapped bars and lacy insets in the drawn thread work. Notice the gridded area over on the left. 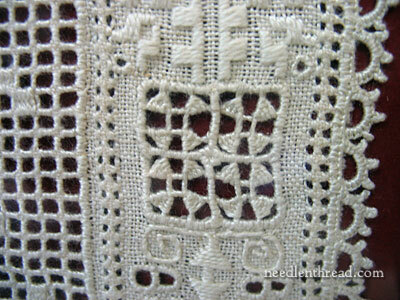 You can see that woven bars, typical of filet embroidery, are also used in Lefkara lace. Notice how, in the embroidered parts of the lace, the design moves from geometric, to a kind of scroll. This squarish scroll work reminds me of Greek designs for some reason. I don’t know if there’s a connection, but that’s what it reminds me of! 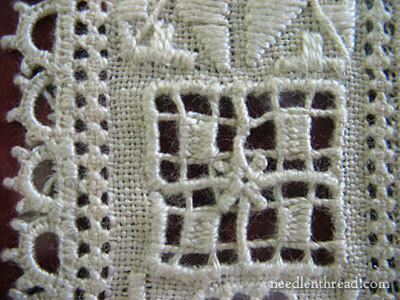 These picots show up often in Lefkara lace – they dot the lace that finished the outside edge of the linen. 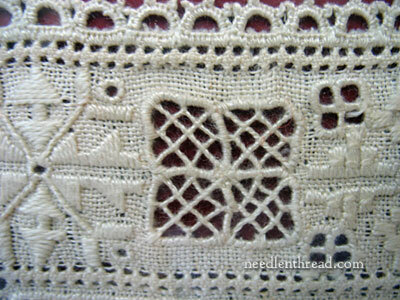 This lace is made with buttonhole stitch – it’s not tatted (as some readers asked). It’s all done by needle. Elissa commented that she found the picots a bit more difficult to make than a typical buttonhole picot. You can see that woven wheels are a typical element in the drawn thread part of Lefkara lace, and that eyelets are typical in the embroidered areas. Here’s an example of woven bars, and a good shot of the lace scallops on the outside edge. I like this circle pattern over the wrapped bars. The circles are made by buttonhole “arches” between the crossed wrapped bars. 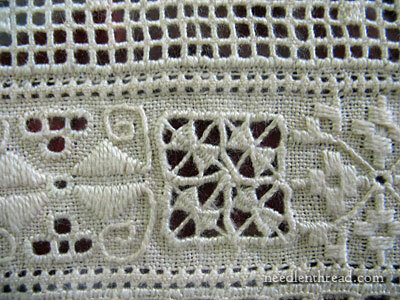 I do love the variety in the drawn thread work! I hope you’ve enjoyed looking at Lefkara lace up close! Thanks, Elissa, for all the photos and the information! If you’re looking for your own piece of Lefkara lace, maybe to give as a special wedding gift or to adorn your own home, feel free to visit the Lefkara Handicraft Center and cooperative, which helps keep the traditions of Lefkaritika alive and which aids the lacemakers make a fair living from their skills. If you have any further information or resources on Lefkara lace, or any questions that I or another reader might be able to help you with, please feel free to leave a comment below. Thank you and Elissa for introducing us to the traditional embroidery from Cyprus. The needlework is beautiful. When we look at different needlework traditions around the world, there is some common ground but there is still so much that makes each tradition unique. I have some pieces that are similar, but not quite as decorative as the ones shown from the Cypress website. Very interesting needlework. I would like to know more about how they do this type of needlework. No, I’m not having a white night. Woke up and thought I’d check you out before getting more zzs. These close ups and the way you’ve pointed out the different design’s points of interest and techniques, has given me an even greater appreciation for the embroidery, embroidering and embroiderers. My learning curve with you is so steep I’ll have to be investing in an oxogen mask to catch my breath! WOW what amazing lace!!!! do you know how one might go about learning to do this lace??? My father’s brother Demetrios (my favorite uncle who passed away about 12 years ago) from the small village of Lythrodondas, married Elou (my favorite aunt, who has Alzheimer’s but who became momentarily lucid and remembered me at my sister funeral-to the amazement of her family!) was from Lefkara. When I was very young, before my parents brought them and their 4 boys to America, we would visit them in Lefkara and I would watch the village women stitch (free-hand and without patterns, of course!). Most of the linens in the villages of Cyprus 40 years ago were stitched in this fashion, but there was always something extra special to the detail work in these pieces of Lefkara. They were renowned throughout Cyprus, even then. The women would proudly show you that the “bad” side was barely distinguishable from the “good” side. As a child, I would take up the challenge to try to find the “bad” side with the women smiling knowingly nearby. I was typically frustrated in the contest. I was given several of these pieces for my “preca” (dowry). Back in Lythrodondas, the women taught me these stitches and cut work when I was very young (because all girls had to know these things). This type of needlework was not something I did again until adulthood when I did hardanger with my friend Becky. Esta es una buena pagina, me interesaria aprender mas sobre este arte. Ah – that is very similar to the norewgian “Hardanger” style – which is also traditionally white on white, with cutouts. Very beautiful lace work. Thank you for the article and links. The video is wonderful. Hello Mary. 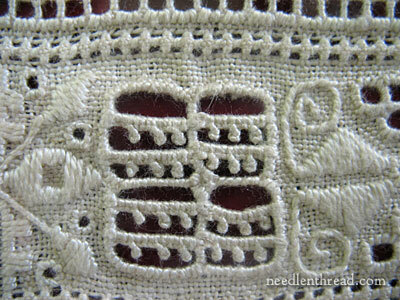 One question please: Does all Lefkara embroidery have the fancy arc needle lace edge? I have several pieces of what I thought was Lefkara embroidery due to the designs and stitchery. All of my pieces have fancy, complex drawn thread borders but no fancy arcs of needle lace. Could mine be Italian, then? Any ideas would be appreciated Thank you. 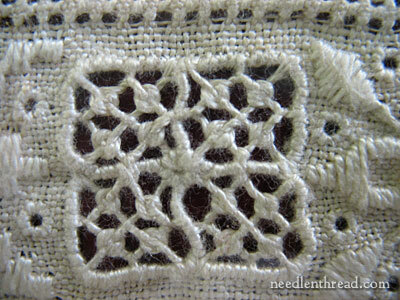 Hi, Sharron – Lefkara and Italian needlelace are very similar, as they share origins. I don’t think the fancy arc is essential on the edge of Lefkara lace, but there usually is some kind of edging, some simpler than others. Your pieces may still be Cypriot, although not from Lefkara. My family is from another village in Cyprus and I have visited Cyprus many times. Beginning in the 1960’s, my relatives started providing me with stitched embroidery for my dowry. Some of my pieces have fancy lace arcs, and some even have the drawn thread edges you speak of. So, don’t be too eager to assign your needlework pieces to Italy! Hi, Sharron. Your embroidered linens are quite lovely! But I would agree that they are not of the typical Cypriot designs. Thank you for sharing your pictures! These ladies do beautiful work. My grandmother died in 1952, but I remember her doing similar work. What a God-giving talent to be proud of. Thanks for sharing. It brought back many pleasant memories . 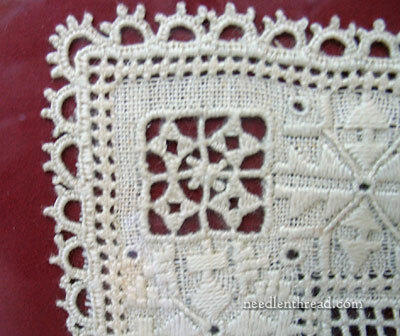 Are there any books published about Lefkara lace that show techniques of patterns? I lived in Cyprus for 1 year 30 years ago, but I still recall my visit to this village and visiting the lace shops. This is really something I would like to do myself, and or create a book/study of the lace and technique. It really is beautiful.